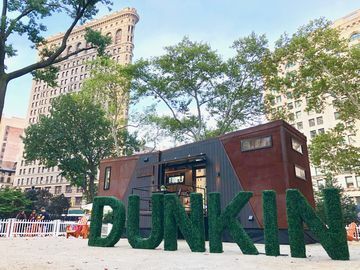 Whether you’re looking for a trendy tumbler, a large cup for all-day sipping, or a spill-proof mug that will keep beverages hot or cold during the morning commute, Dunkin’ Donuts’ Premium Stainless Steel Tumbler was specially designed to serve our busy guests on-the-go. 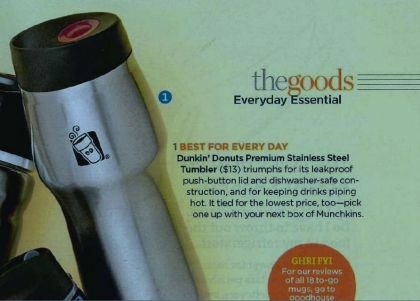 Today we are DDelighted to announce that Good Housekeeping recently recognized Dunkin’ Donuts’ Premium Stainless Steel Tumbler in their “Top Travel Mugs” list for September 2012! In order to determine the ranking, Good Housekeeping put 18 travel mugs to the test. 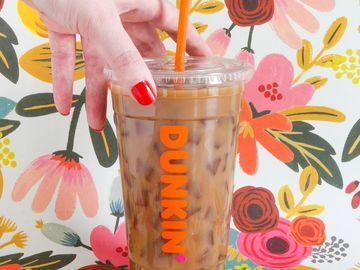 Dunkin’ Donuts’ tumbler earned the top honor in “Best for Every Day,” a category that we feel is a perfect match for our guests who require both a functional and “coffee chic” design. 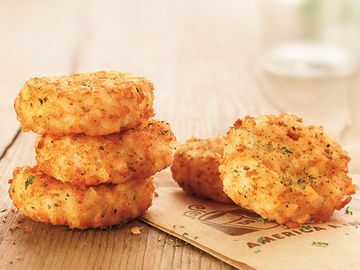 The magazine highlighted the tumbler’s “leak-proof push-button lid and dishwasher-safe construction,” as well as its affordable price and ability to “keep drinks piping hot.” The tumbler makes a perfect gift for friends and family, or (as Good Housekeeping recommends) a just-because treat to pick up with your next box of Munchkins! 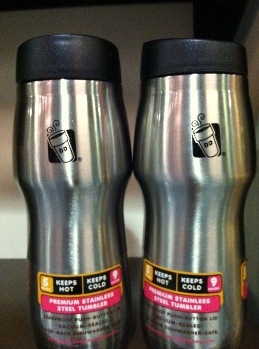 The Premium Stainless Steel Tumbler is available while supplies last at participating U.S. Dunkin’ Donuts restaurants. 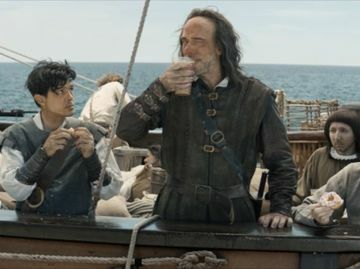 We hope that you will join us in congratulating our famous and award-winning travel mug! To check out more DD merchandise, visit your local DD, or check out our online store (note: The Premium Stainless Steel Tumbler is only sold at participating U.S. DDs).